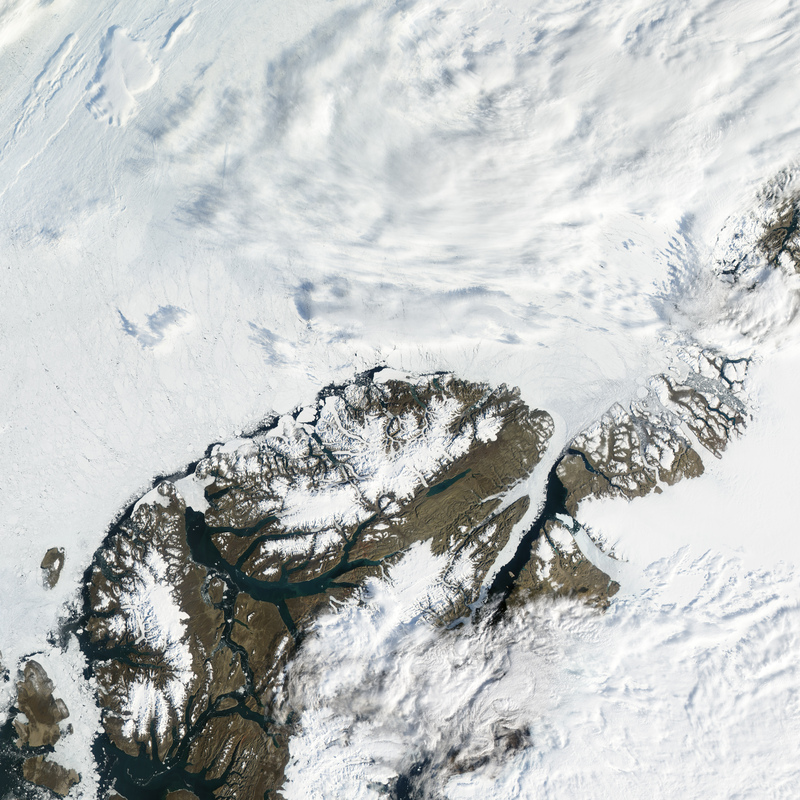 In mid- to late August 2010, a Bermuda-sized ice island broke free from the Ward Hunt Ice Shelf along the northern coast of Canada’s Ellesmere Island. The Moderate Resolution Imaging Spectroradiometer (MODIS) on NASA’s Aqua satellite detected fractures on the shelf on August 18. The breakup on this ice shelf continued a years-long pattern of retreat on the Ward Hunt Ice Shelf, and a decades-long pattern of retreat of the ice shelves along the Ellesmere coast. The top image shows the ice shelf on August 18, 2010. For comparison, the bottom image shows the same area almost eight years earlier, on August 22, 2002. The fractures on the shelf in 2010 occur immediately south and east of Ward Hunt Island, and a large chunk of ice appears to be floating free from the shelf immediately east-northeast of the island. Although the ice shelf appears larger west-northwest of Ward Hunt Island in 2010, the larger area of ice is due to sea ice temporarily frozen to the ice shelf. 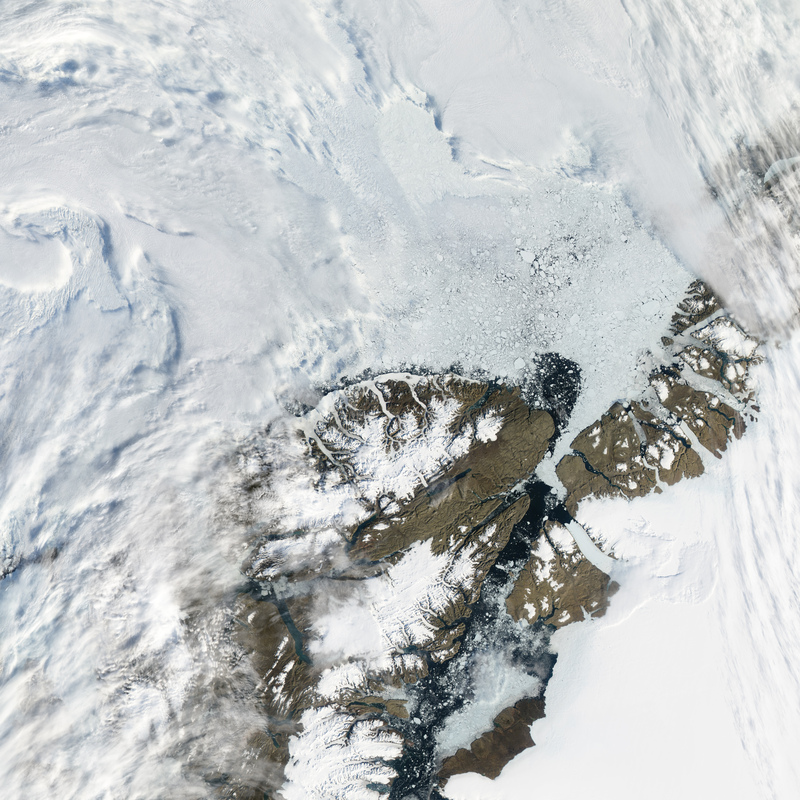 South of the ice shelf, fjords that are covered with thin ice in 2002 are largely free of ice in 2010. 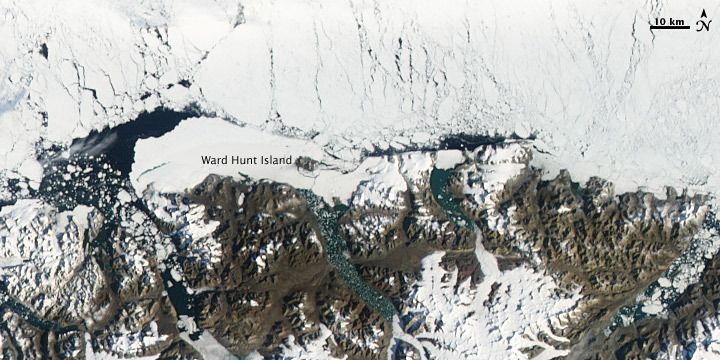 At roughly 54 square kilometers (21 square miles), the ice chunk that broke free from the Ward Hunt was much smaller than the ice island that calved from Greenland’s Petermann Glacier a few weeks earlier, but in some ways, the Ward Hunt fracture was more significant. Fed by the Greenland Ice Sheet, the Petermann Glacier is a floating ice tongue that periodically calves large icebergs, and is replenished by new ice upstream. 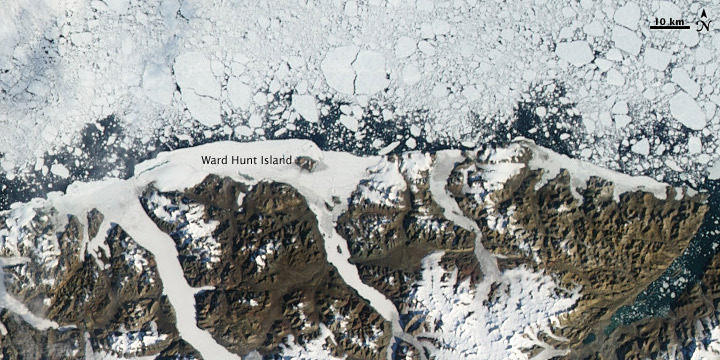 In contrast, the Ward Hunt Ice Shelf formed from compressed sea ice that was gradually replaced by accumulated snow. No glacier feeds the Ward Hunt and advances it seaward. The calving cycle on the Ward Hunt is slow, and to recover from the recent retreat would require centuries. Driftwood and narwhal remains found along the coast of Ellesmere Island where the shelf is attached have radiocarbon dates from roughly 3,000 to 6,800 years ago, implying that the ice has been in place since those remains were deposited. Breakup along the Ward Hunt indicates a change in the conditions that previously allowed this ice shelf to persist for millennia. At the dawn of the twentieth century, glaciologists estimate, the northern coast of Ellesmere island was lined by a continuous ice shelf covering roughly 8,900 square kilometers (almost 3,500 square miles). A century later, the once-uninterrupted shelf had been reduced to a cluster of much smaller ice shelves, including the Ward Hunt. The Ward Hunt cracked in 2002, draining a freshwater lake that floated on top of denser seawater, and wiping out a unique microbial ecosystem. In 2008, another rapid breakup occurred. Despite the fracturing on the Ward Hunt that occurred in the summer of 2002, that year actually experienced cooler conditions than 2010. When the Ward Hunt fractured in July 2002, nearby sea ice held the fragments in place, like giant pieces of a jigsaw puzzle. Later sea ice retreat in the Arctic gave the ice islands room to roam. North of the ice shelf, sea ice appears more abundant in 2010 than in 2002, but warmer conditions and a slight retreat of sea ice from the Ellesmere coast gave the ice that fractured in 2010 similar space to migrate. NASA Earth Observatory image created by Jesse Allen, using data obtained from the Goddard Level 1 and Atmospheric Archive and Distribution System (LAADS). Caption by Michon Scott based on interpretation by Ted Scambos, National Snow and Ice Data Center. Acquired August 18, 2010, and August 22, 2002, these natural-color images show changes on the Ward Hunt Ice Shelf on Canada’s Ellesmere Coast. CBS News. (2010, August 24). Huge ice chunk breaks off Ellesmere Island. Accessed August 26, 2010. Evans, J.A. (2008). An early Holocene narwhal tusk from the Canadian high Arctic. Boreas, 18(1), 43–50. Scott, M. (2004, January 20). Breakup of the Ward Hunt Ice Shelf. Earth Observatory. Accessed August 26, 2010. Scott, M. (2008, September 5). Rapid retreat: Ice shelf loss along Canada’s Ellesmere coast. Earth Observatory. Accessed August 26, 2010.